As many of you know, Leonard Nimoy, most famous for his role as Spock, passed away today. A lot of people outside of the Star Trek fandom do not understand what Spock brought to the world, and therefore do not understand what we have lost. Spock is not just a guy with pointy ears. He's a complex character who developed beautifully over decades of Star Trek episodes and movies, enriching millions of lives in the process. He's half-human, half-Vulcan, and it takes him a long time to figure out his place in the universe. As a Vulcan, he is born with strong, primal emotions that would lead him to madness without careful discipline. He's taught that he has to purge all emotion completely. So, when we first see him, he appears completely emotionless. He refuses to acknowledge that he has any feelings at all. Yet, he spends every day among humans, who are free to express emotion without the same consequences. He has these two halves, one that tells him that feelings will make him a monster, and another that tells him that he's a monster for not feeling at all. As a result, he really feels like he doesn't belong anywhere. He's a man without a home. But you can watch Spock as he starts to reevaluate what he is being taught, as he starts to think that maybe there's a middle ground between these two worlds, and as he slowly finds a balance between these two parts of him and ends up with an inner peace he never dreamed of. In the end, Spock is a whole, healed person. This is a story that is not told often. It is not told as completely, or as well. But Leonard Nimoy's performance speaks to outcasts of all kinds: people who are bi-racial, people on the autism spectrum, people with depression (me), and many, many others. There are a lot of people out there who just don't feel like they belong. A lot of them feel like they can't ever be their true selves, that in order to fit in, they have to be someone else. Spock showed us that not only is it possible to find peace with who we are, it's a necessary step to happiness. It's not about fitting in. It's not about rebelling. It's about finding a balance between the two, and finding the discipline to be your best self. This message is so important, and so very rare. I am so very thankful to live in a world where this message is expressed at all. Of course, Leonard Nimoy was so much more than Spock. He didn't just play the part and fade away; he was involved with fans until the end, listening and encouraging them to lead better lives. He became a grandpa to the world. I feel so blessed to be in a world that had him in it. He will be sorely missed. As a person who is continually focused on self-improvement, I really love starting fresh. I love a new year, a new month, even a new week. So this time of the year (even though it's cloudy and cold and distinctively not Christmas) is one of my favorites. I like taking time to take stock and learn more about myself. One of the things I've been interested in is the Myers–Briggs Type Indicator (or MBTI), a personality test that I find really helpful. According to MBTI, I'm an ENFP, i.e. Extroverted, Intuitive, Feeling, and Perceiving. Really, it's just a way to explain how I see the world, and how I react to things. I find that reading about ENFPs is a good way to learn about myself and figure out how to move forward. ENFP: They will be hurt by the insult but will not let it change what they already believe about themselves (however, if it is something they are self-conscious about already they will be extremely hurt). Wonders whether there was an emotional cause (either something you did or an emotional problem the other person had) that caused the outburst. And wow, does that really describe the way I've been reacting to some really mean people in my life. You see, guess I have this tendency to collect mean people? I mean, sometimes they kind of accumulate around me, like parasitic barnacles. At some point, someone will point them out for me. "Um, Cecily," they'll say, "why are you allowing an arthropod attach to you and feed by extending thread-like rhizomes of living cells into your body?" Wait, no, that's not what they say. They're not in on this metaphor. "Cecily," they'll say, "why do you let that person hang around you? They're mean to you." And really, you should probably put distance between yourself and people who are mean to you. That sounds like a sentiment expressed in some kind of after-school special. And I've learned that most people are really kind, and sometimes hearing my story makes them feel comfortable with their own faults. I like that. I'd like to live in a world in which people are okay with the fact that we are imperfect people who are (ideally) on a journey to perfection. To me, that's what my faith, and what Christianity in general is all about. I feel like being a true Christian is learning to accept and embrace the possibility of change in yourself and others. So when I open myself up like that, I'm just trying to do my part to create that world. But I've also learned that some people don't see it that way. Some people hear you say that one time you had this embarrassing moment, or one time you overcame this problem, and they decide that they've found a weakness. They decide that they want to exploit that weakness by bringing it up as often as possible. Out of context. In private, in public, and behind your back. And after a while, I figure out that I have to be careful about these people, and I stop being open with them. I figure that I shouldn't hand people a knife if they have a penchant for stabbing. But, at the same time, I feel like being open about faults isn't a weakness. I feel like taking advantage of it is. Whenever someone is mean to me, once I get over the initial sting, my first thought is to wonder why they would do such a thing. And the deeper the cut goes, the more data I collect to solve the puzzle. That, in a nutshell, is how and why the barnacles accumulate. You see, over the course of my life, I've realized that when people are mean, they usually are acting out of a place of pain. So, the meaner you are to me, the more you are revealing your own personal pain. And the more you expose your personal pain, the more data points I'll collect to narrow down the reason for your pain. Maybe, by now, I've mapped out your worst nightmares. And you know what? In the end, you can hurt me, but you really can't change me. I'm not going to have an existential crisis because you're trying to put me down. I already know who and why I am, but thanks for playing. You see, every first of January we can sit down and decide who we are, and who we want to be. But it's not platitudes written on paper that show us who we are. You show who you are by the way you react to me. I show who I am by how I react to you. So, as I approach a brand new year, I find myself looking at these barnacles and wondering if maybe it's time to scrape some off. Maybe I'm trying to solve too many mysteries. Or maybe I need to respond to a cry for help, no matter what form it comes in. I don't know. 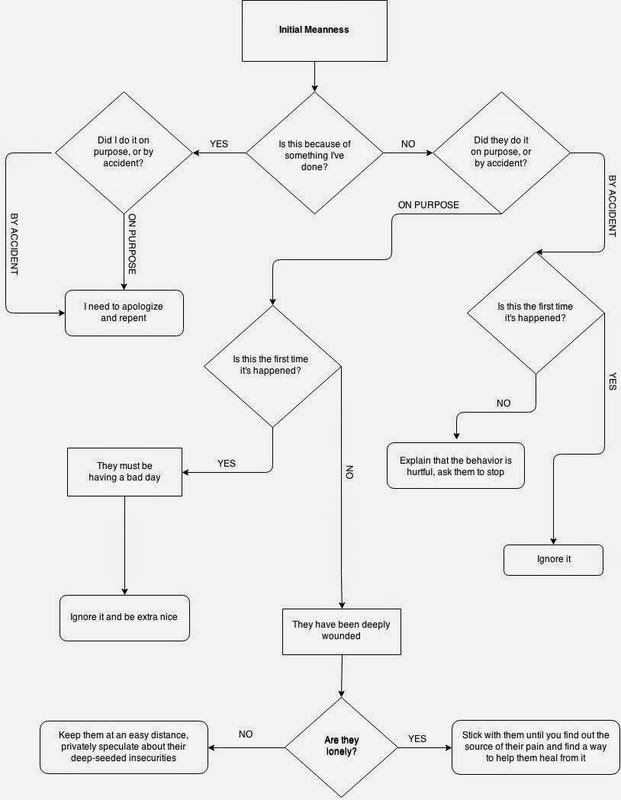 But I'm pretty sure that my flowchart needs work. *While I do find that most of what's written about ENPFs is really accurate, I also have to factor in my Clinical Depression™. Sometimes I've been so unstable that I've defined myself by what other people said about me (even if it was mean and baseless). There were times when somebody said I was bad at X, and in my mind, I've become Bad at X Girl. Luckily, these days I've become a lot healthier, and I rarely have those thoughts. I Have Strong Feelings About Salad, Okay? I mean it. Sometimes salad makes me mad. I attribute most of this to the fact that I don't like salad dressing. Like, the smell of ranch makes me want to vomit. That's what I mean when I say that I don't like it. And I realize that this is just a quirk of mine, and some might even say that this is a fault. I'm picky, in this way at least, and I'm making life harder on everyone around me by disliking something that everybody else loves. I won't dispute that argument. But what I will say is that when you live life dressing-less, you start to see the world differently. Well, at least you start to see salad differently. And let me tell you something: a lot of you don't realize this, but what most people call salads aren't really salads. Most so-called salads are really just lettuce with gobs of oil and fat poured over it. Sometimes, the salads I get served at restaurants just make my blood boil. Did I just pay $2.99 for a couple of leaves and a few slivers of carrot? Yes, yes I did. Something is wrong with this world. Now, anyone who knows me will tell you that I am not a particularly calorie-conscious person. One time, I was in the check out line at a grocery store and, to my horror, I discovered that I accidentally picked up a reduced fat gallon of ice cream. I may have screamed audibly. So, that said, when you eat a salad without the dressing, you experience something that a lot of people hardly ever experience. You find out what lettuce actually tastes like. And man, some of it literally tastes like dirt, so I don't really blame you. But at the same time, I wonder if lettuce tastes like dirt for a very simple and obvious reason. Maybe going dressing-less makes you wash your lettuce a little longer than other people. Just saying. But yeah, I definitely know what lettuce tastes like. I also know what tomatoes, cucumbers, and carrots taste like. And I am happy to eat them solo. But I know a lot of people who never do that, and that really worries me. I mean, not to judge you as a person or anything, but if you can't eat a vegetable without drowning it in fat, then maybe it's healthier to not eat vegetables at all? And that's kind of sad? Okay, now that I have that off of my chest, I'd like to thank you for your time. Please feel free to add your own food quirks/rules in the comments. In the meantime, I will continue my ongoing attempts to convince my family that while preparing a salad for a group, you can just leave the dressing on the side. That way, people can choose how much of which dressing they want. And the dressing doesn't get soggy. Everyone wins! My sophomore year in college, I had a roommate who, at that time, was one of the most confounding human beings I had ever met. I'm not into naming people on this blog without their permission, so I'll call her Sarah. Sarah confused and frustrated me, not because she was a bad person, or because she did anything wrong. She confused me because she was a punk rocker. And a Mormon. Usually those two don't mix, and if they do, it doesn't end well. I remember being very concerned for the welfare of Sarah's soul. It kept me up at night. I heard her dark music, and the dark movies she liked, and the way her clothes were more like costumes than anything, and I was so worried that she was going down some path that was as dark and angry as her taste in, well, everything. And yet, at the same time, she would go to church with me like it was the most natural thing in the world. And even though I expected her to be ignorant of gospel topics, she always held her own when we talked about it. Actually, sometimes her understanding just blew me away. You see, I grew up in California, one of the most diverse places you can find these days. I met all kinds of people who lived all kinds of lifestyles. I had friends/acquaintances of every race and religion. Punk rockers? I knew a lot of those. And they had a strong tendency to sit in the halls during church and complain about how their parents forced them to go. And a lot of them were actually pretty awful to me. Not all of them, though. Just a lot of them. Of course, at the same time, I was in the throes of my Great Battle with Clinical Depression™, and a lot of the dark music was a mirror for what was happening in my heart. I had gone through the worst of it by then, but I hadn't figured out how to manage my condition. When I moved in with Sarah, I was pretty messed up. So maybe it wasn't just Sarah I was worried about. Maybe I felt like I was climbing out of this great, deep hole, and I was worried that Sarah would pull me back into it. And one day, I don't know how, or why, but I must have said something weird, because Sarah came right out and called me racist. RACIST! I was so shocked that I think I just blinked at her. Sure, she was Latina. I mean, that was obvious. But I grew up in California. I took Spanish in high school, where I was one of three white kids in the class. My parents were both fluent Spanish speakers, who lived in Portugal and Argentina as missionaries. I knew what a bombilla was and how to use it. I could make my own dulce de leche. I mean, come on. How could I be more accepting of her skin color? I knew lots of Latinos (still do), enough to know that they all came from different circumstances and had different strengths and weaknesses, just like all other human beings. The idea that Sarah's race could even effect our relationship in a negative way just boggled my mind. So I knew that I had to tell her. I knew that I finally had to say what I had spent months trying not to say. I told her it wasn't her heritage that bothered me; it was her subculture. And I told her that it wasn't really her clothes, but her soul that I was ultimately worried about. It's weird, sometimes, how one simple truth can change everything. Her truth, that she saw me as racist, changed my entire perspective of our relationship. Of course she saw my confused expression as a scowl. (I was deeply unhappy with my life. Most of my expressions looked like scowls.) Of course she saw me taking my distance, and saw it as disgust. Of course that was the source of the tension in our relationship. Only, it wasn't true. So when I shared my truth with her, how I was really feeling, she changed her perspective, too. Instead of being offended, she understood that I just didn't get it. So she explained it. She explained to me why she liked those bands and those specific songs and why Tim Burton was so great to her. She told me that she knew she didn't dress or act the way that other people did at church, but that didn't matter. As long as she followed God's commandments (and she did, that also confused me), she didn't care about conforming to the rest of it. I honestly don't think I would have ever been able to be the person I am now if I didn't know Sarah. She helped me so much! And Sarah isn't the only "Sarah" I've run into over the years. I've met other people who were as confusing to me as Sarah was. I still do, really. Sometimes I have to explain to them that that look on my face is not judgement as much as it's a "Huh?" Well, maybe there's a little judgement in there; I'm not perfect, yet (still working on that). It's just that I need to find a way to adapt. But we all get used to the way we see the world. We like to surround ourselves with other people who see the world the way we do. And then someone comes along that we can't fit in a box, and it breaks that glass box we were in. You know, that glass box that you trap yourself in, without knowing it, where the people you like are on the inside and the other people are on the outside. And then it shatters, and you're not sure that you knew it was there in the first place. That glass box. Sometimes, I wonder if I live in a series of glass boxes, like a Russian nesting doll situation. I shatter one glass box, and I think I'm done. All the people on the outside are now on the inside. I'm free! Until I get to the next glass box, which is bigger and more complex. I walk right into in one day without knowing it was there, and I realize that I have to shatter that box, too. And another box. And another one. Will I ever get out of these boxes? Is this some kind of glass spaceship, and when I shatter the last one, I'll find myself in the nothingness of space and all of us will suffocate and explode? Okay, probably not. But sometimes when you're standing in front of your glass box, and you put your hand on the panes, it can feel that way. It's really scary to give up our mindset and open ourselves up to change. But we all have to do it if we want to be better than we are. If we want to really see the world the way it is. It's funny, now, to think of me inside my glass box while Sarah was in hers. How wrong we were! But we were smart, too, because we were willing to get ourselves out of those boxes and actually see each other. Hopefully, I will get the chance to truly see many different people. *Sometimes, I look back on my life and wonder why, after all the pain and anguish I went through, I didn't go through a punk phase. Or a goth phase. Instead, I buried myself in musical theater and science fiction, and refused to wear any other other than blue. That's just weird. **I'm not saying that I'm 100% un-racist. I don't know that anyone is. It's an ongoing process. I'm just, you know, trying. Life is getting political again. Or maybe it always is. Maybe I just manage to ignore it the rest of the time. Anyway, I have a lot of friends that have opposing political viewpoints. I've lived in California, Utah, and Oregon, so I feel that I can say that with perfect honesty. Some of my friends agree with my political viewpoints. Some of them don't. And you know what? That's fine. I've always thought that if everyone thinks the same way, then maybe no one is really thinking. But that stops becoming fine when people get mean. And it seems that mean is all people get these days. I feel like there used to be a time when people could see a member of an opposing political party and still think of that person as good and moral. This time may have been before the advent of cable news. As I grew up with cable news, I'm not sure if this period of political politeness is real or myth. But whether or not it ever existed, here's the thing: most people want the world to be better. Like, ninety nine percent of us. Most of us want to be happy, and we want our neighbors to be happy, too. We want everyone to be happy, really. Most of us don't like problems, and we'd much prefer it if those problems would go away. Really, if you don't see people this way, I challenge you to get to know more people. I challenge you to set aside your prejudices and find someone who is very different than you, and honestly try to understand their viewpoint. It's not an easy skill to master, and most of us (like me) only develop this skill when we have to. Like when someone we love decides to step into one of those groups that we don't understand or that we despise. This happened to me once. Well, more than once, really. But one time it happened in a way that I could not ignore. Someone that I love dearly, who I always thought was on my side, suddenly moved to the other side. And s/he did it in such a dramatic way that it ruined our very precious relationship. So, out of desperation, I decided to try to repair that relationship by any means necessary. And one of those means happened to be sitting down and trying to figure out why s/he did it. And trying to figure out how a person could do that and still be a good person. And, in this specific case, part of the change was political. I'm a conservative. This person used to be, too, until s/he decided to adopt a staunchly liberal viewpoint. It didn't happen overnight, but it seemed to. It took me by surprise. So, because of this and because of other aspects in our relationship, I spent a lot of time feeling betrayed. I spent a lot of time really hurt. And I'm not going to say that this was all in my head, or that I was stupid, because the truth is that my feelings were real, and they came from things that were done and said to me. But, after a while, I decided that it was time to heal. Pain gets tiresome after a while, you know? So I did something drastic: I applied the principles of the gospel of Christ and I made a sincere attempt to love my new enemy. And that included trying to understand liberalism. And you know what I found? Pretty much everything I mentioned above. That people are good and want to world to be better. Even liberals. Because it took a lot of time and effort, but I figured out why liberals are liberal (and why conservatives are conservative). And that changed the way I looked at the people I oppose politically. Here's what I learned. The difference between liberals and conservatives is that conservatives want to affect change via private methods (charities, private businesses, private organizations, etc.) and liberals want to affect change via public methods (government programs, etc.). And what is the change that liberals and conservatives are trying to affect? Often it's the same. I mean, it's the same if you look at the big picture. It's not if you look at specific issues, seeing as conservatives and liberals are often at odds when it comes to almost any specific issue you can find. But when you talk about values, the big difference isn't a what. It's a who. It's who is going to solve this problem. And when you start to look at it that way, a lot of the stereotypes and all-around nastiness just falls away. Conservatives, like me, aren't cold-hearted tightwads who want everyone else to live in poverty while they raise themselves to excessive wealth. Conservatives simply would prefer it if the task of solving problems was in the hands of the individual citizens, and not in the hands of the government. Liberals, on the other hand, aren't lazy money-grubbers who want to force you to solve all their problems. Liberals simply believe that the government is better equipped to solve the problems in America than individual citizens are. That's how I look at all of this. That is how I look at all of us. That's how I can find the good in the people who oppose me. But this viewpoint doesn't only help you understand the people in the other camp. This viewpoint is why I can call myself a conservative and still feel free to disagree with the political party that I'm supposed to be a part of. That's how I can disagree with other conservatives. It's my core understanding of the role of the government that makes me what I am, politically. It's the other parts of me, the religious and experienced parts, that shape my views into specific beliefs and lead me to push for specific methods to achieve specific outcomes. But, you know, I'm not the only person who can say that. Everyone should be able to say that. It's my hope that one day, we can get to a place where we can respect those who disagree with us. I hope that one day we will look through the eyes of our enemy without a fear that it will demean or debase us. My journey to understand others didn't change my values; it made me strengthen and better understand the values I already had. It actually made me a better person. And really, we should never be afraid of applying the teachings of Christ into our lives. Not ever.